Hot Wheels, Matchbox, Johnny Lightning, Ertl, Revell, etc.. no matter which brand or medium you happened to grow up with, some guys n gals just cant put them down. 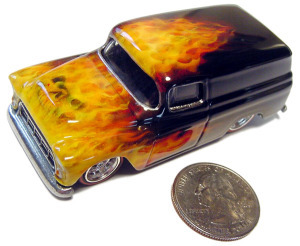 We love diecast cars And we love to customize them to suit our own tastes. Customizing diecast cars has been around since the diecast cars themselves of course, but really gained popularity in the 90’s with the introduction of a little thing called “the internet”. This combined with our long time fascination with automotive design in general, opened up a new genre for those who to that point had been mere ‘collectors’ of cool little diecast cars like the late 60’s Hot Wheels from Mattel. Yes, there was already a large and faithful following of people who intensely collected the latest editions and variations of Hot Wheels..but those who envisioned something different when looking at that latest find, started switching out wheels, giving it a new shade of paint, maybe even a decal or two. Then body parts started being merged and suddenly, even those who could not afford (or just chose not to) to customize a “real” car, could be a kustomizer! Well, thats what Hot Toy Cars.com is all about…Customized Diecast!! We showcase Diecast Events such as national conventions, in process and how to articles. Also HTC is the new outlet for Ultra High Quality KB Kustoms For Sale via the sites shopping cart system. HTC is also on Facebook and Twitter.